Latest trends of modern app design essentially make apps that work on several platforms. This is essential to set equilibrium in brand functionality and platform principles. With equilibrium absence app might be out of place and hard to adapt. Designing for Android and iOS is a tough challenge. iOS user interface conventions very much vary in comparison to Android. If moving the apps from previous to latter ones, it’s vital to remember original design pattern and end user expectations. Both platforms have unique actions and set phrases. Therefore it’s better to be mindful of outline of variation and parallel prior to designing or developing apps. 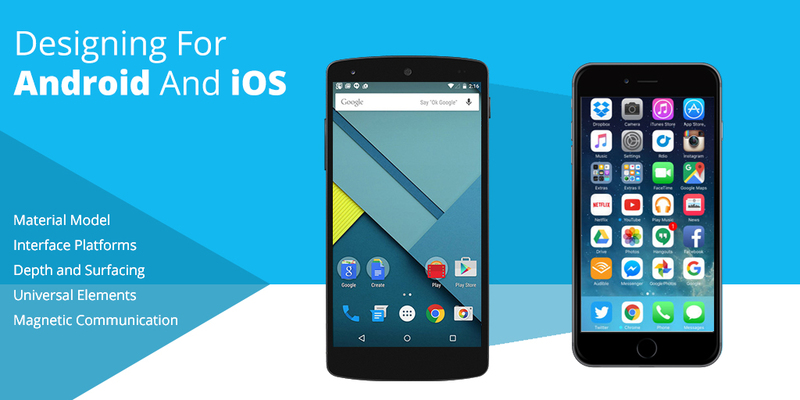 Material design is the future of cross platform design. It uses unique facades, noble graphics, resolute action operating like guiding principle for accurate software actions. Material design is the visual language of Android 5.0 powered devices. This is recommended for fresh designers to get acquainted with starting principles. While opting for platforms is appropriate to ensure best choice guaranteeing best market placement for the app. Studying parameters like; users; their demographics, preferred operating system, can they choose paid apps? This facilitates in opting for correct platforms for apps. Apply special models in harmony with platforms being working used. Using depth creation or surface elevation determines which platforms give desired qualities. (iOS use blur effects to indicate depth, whereas Android applies elevated shadows and surfaces). Universal design elements are headers, status bars, search filters, etc supposed to appear on every page of an app. They must retain even; size, style, color on all pages to feel native and consistent. User-inspired motion and touch responses are among significant elements of material design. Sometimes, when users tap on buttons they get instant reply like rising expansion of button.This magnetic communication between some elements and user fingers is gradually switching customary color fading used by iOS. User Interface imitations aren’t recommended while aiming for specific app stores, as none can feature opponent aimed apps. Action sheets allow users choose precise actions from one user interface point. For instance, when users touch or press longer images this may either copy, upload, share or delete images.Android and iOS possess matching action sheets but in depth indicators both platforms differ.Android overlays have bold character with reticent dropping shadows to point out the upper paper layers. iOS overlays use negligible background transparency. Android and iOS are different especially devices on old Android versions with physical buttons and ubiquitous action bars. For iOS platforms action bars are most similar feature of both platforms. These disparities are natural as both platforms are for divergent uses.For Navigation bars Android allies text, while iOS centers it. Logos are used in iOS, unlike Android. Status bars having sets of vital information like time, connection and battery are quite alike and subject to unified structure.